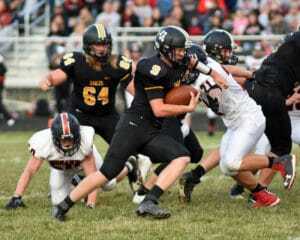 NORTH ROBINSON — The Colonel Crawford Eagles welcomed Northern-10 Athletic Conference foe, the Mohawk Warriors to their home field on Friday night. 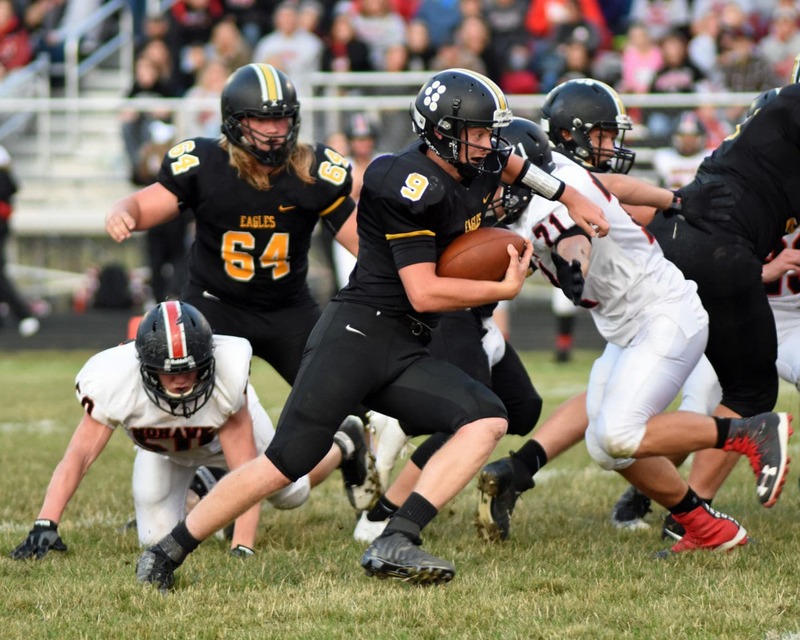 Crawford, looking to bounce back from their first league loss last week to Carey, will head into week four with a 1-2 overall record and 0-2 conference mark after Mohawk came away with the 34-20 victory. After the first quarter, the Eagles trailed the visitors 8-0 and would get on the board in the second but would head into the locker room at halftime trailing by a tally of 16-6. 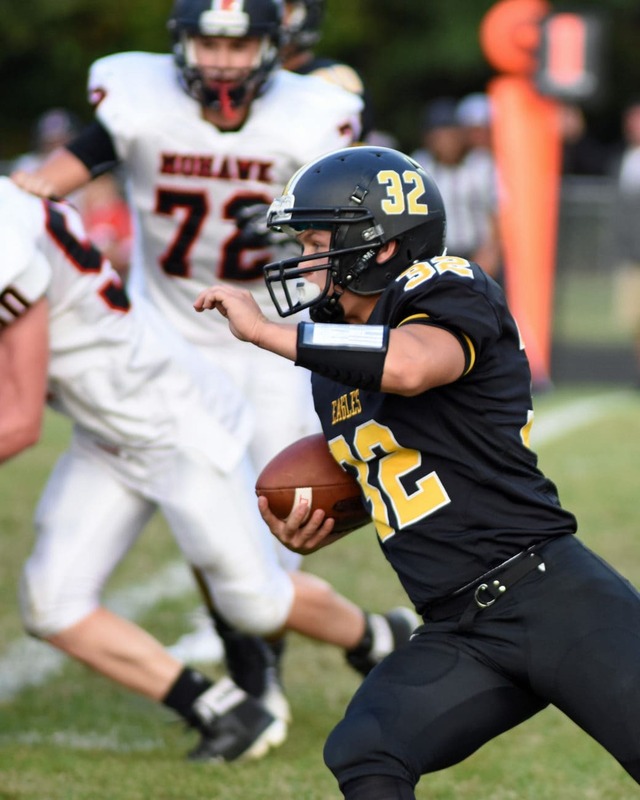 Another scoreless quarter in the third put the home team down 28-6 and despite their efforts and putting up 14 points in the final quarter, Mohawk would come away with the win. Quarterback Hayden Bute went 11/20 through the air on Friday night for 117 yards and an interception. On the ground, Bute carried the ball six times for 27 yards and a touchdown for the Eagles. The primary target for Bute on the evening was Kaleb Landin. Landin notched 94 yards and a touchdown on five receptions. Landin also would pick up Crawford’s only interception on defense. Colonel Crawford quarterback Hayden Bute weaves through the Mohawk defense Friday night at Gary Field en route to a 34-yard touchdown run. Photo by Don Tudor. Kyle Shope caught one pass for 13 yards and Cameron Smith put up nine yards on a single reception. Trevor Shawber was held to just 86 yards on 19 rushing attempts but would record a touchdown for the home team. Spencer Mutchler converted both of his attempted extra-points on the night in the loss. Colonel Crawford’s defense allowed 205 rushing yards on 43 attempts that racked up two touchdowns. Through the air, the Eagles gave up 14/22 passing and 171 yards for three scores. The Eagles will look to right the ship next Friday when they head to Bucyrus to take on the always tough Wynford Royals.